The D-backs are well-known for their propensity to select college arms over high school arms in the upper rounds of the draft. Looking over the last five years of drafts, the only high school arms selected by the D-backs in the top three rounds are Jarrod Parker (1st round, 2007), Brett Anderson (2nd round, 2006) and Kevin Eichhorn (3rd round, 2008). But Arizona adhered to this rule even more-so in 2009 than usual, taking no high school arms in the first 10 rounds. 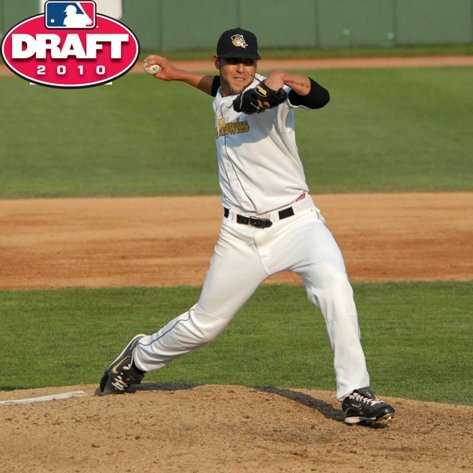 This included their second-round selection, and their second-straight pitcher selected, Eric Smith from the University of Rhode Island. Smith is precisely the type of pitcher the D-backs are known for developing — a ground ball inducer with a good sinker and solid control. Smith was originally assigned to Rookie-level Missoula to get his first taste of professional baseball and he had mixed results. He was superb at inducing ground balls, with a 2.6/1 GO/AO ratio and just one home run allowed in seven starts and two relief appearances spanning 25.2 innings, while also striking out 21. However, his typically-good control had some slip-ups, as he also walked 16 batters, leading to a 4.21 ERA and 3.91 FIP. Nonetheless, the organization demonstrated its confidence in Smith and sent him to Single-A South Bend near the end of the season to gain some experience at Low-A while helping the Silver Hawks in their playoff push. Smith’s overall numbers looked much better for South Bend, as he maintained a 2.76 ERA in three starts (16 1/3 innings), and while his control was much better, as he walked just six, his other rates turned for the worse. He allowed two homers, had just a 1.47/1 GO/AO ratio, and only struck out 10, culminating in a 4.55 FIP. So, to start 2010, the organization kept Smith at South Bend to try to improve his peripherals. Smith has done that and a lot more. His GO/AO ratio has rebounded to a marvelous 2.50/1, he has given up just two home runs, and he has a 39:15 K:BB ratio in 51.2 innings. All of this had added up to a superb 2.79 ERA and 3.03 FIP for Smith at South Bend. This includes a stretch of 22 innings that began in the fifth inning of his first start, through his next three starts, and two innings into his fifth start where Smith did not allow a single earned run. During this stretch, Smith struck out 17 batters, had a 2.21/1 GO/AO ratio, and did not walk a single batter. He carried an FIP of 1.65 and a WHIP of 0.55, and his season ERA had dropped to 0.69. One thing worth noting, though, is that the organization is carefully monitoring Smith’s innings, as is typical with young pitchers. Nonetheless, with Smith’s college resume and polished sinker, it’s not too hard to imagine that Smith could be a meteorically-fast riser through the Arizona system.